Boy, that last post set struck a nerve, didn’t it? First off, I applaud and respect Portland/Oregon soccer fans for their dedication and zeal in attempting to bring MLS to PDX. But I can’t agree with their means to an end. Yes, public school funding comes from Salem. However, the city of Portland neither has endless coffers nor endless credit. If Portland issues the $80-million-something in bonds (assuming that’s all it takes to get these stadia built), that’s $80-million-something in bonds that aren’t issued for anything else. Stadium funds are stadium funds, and yes, by law, can only be spent on such things. But given that the public at large understands these are times when we’re learning to do without “such things,” why should Merritt Paulson be granted an exception? I mean, if Gov. Ted feels Oregon schools need to do without the rainy day fund, why is anyone clamoring en masse for Major League Soccer? And if Paulson is willing to go so far as back the bonds with his own fortunes, it suggests that he’s certainly capable of paying for the new parks himself. So let Paulson do just that. He wants to re-renovate PGE Park? Go for it. He wants to move the Beavers elsewhere? Sure. Do it, but just not on the public dime. MLS appeals to a very specific demographic. And while I clearly love baseball, not every taxpayer in Portland needs to subsidize my fandom. And not every taxpayer needs to subsidize a wealthy franchise owner who can easily afford to make the changes he wants to make. For the last time, NO! update: Welcome, Taibblog and Reason readers. The Portland school district, like many others in the state of Oregon, is considering trimming from an already-short school year – Oregon has among the shortest school years in the country, and lost quite a few more days this past December to snow – no surprise given the fact the state has quite the budget shortfall on its hands for this and the next biennium. How dire is the situation? Gov. Ted Kulongoski, in all his wisdom, recommended that the state’s teachers work five days this year without pay. Not any other state employee – just the teachers. No matter how one feels about that situation, clearly the state and most of the cities of Oregon aren’t exactly flush with cash these days. Yet in spite of all this, Merritt Paulson (son of former Treasury Secretary Hank), continues to push a plan to build a new baseball-only facility for the Triple-A Beavers, and to convert the recently-renovated (at taxpayer expense) PGE Park to a football/soccer only facility. If the city of Portland provides the necessary funding for these two stadium projects, Paulson intends to then spend the $40 million Major League Soccer franchise fee, thus bringing an MLS team to Portland. So during a time when consumer confidence has hit record lows, and businesses short on credit are ratcheting things down, Paulson wants Portland taxpayers to spend at least $80 million (the projected cost of the two stadium projects) on his business venture? Nevermind the debatable popularity of MLS – isn’t this the league that mega-star David Beckham just ditched – spending tax dollars on a special interest, so to speak, is sad and pathetic given what PPS is considering. Let me reiterate – Portland schools face massive cuts, and Son of Hank wants tax money to build stadia? No, no, no, no, no, no! For as much as I enjoy sports, I cannot with a clear conscience agree that taxpayers ought to subsidize it. For all the to-do about “socialism” in our culture today, it’s thoroughly vexing why any American would want the taxpayer to subsidize such a limited interest. Sports are hugely popular, but by that same token, they’re hugely unpopular with just as many people/taxpayers. Stadium construction-as-public works projects stimulate the economy only insofar as the construction is concerned. Once they’re built, the only jobs left are minimum wage beer and hot dog vendors and ticket takers. There is no “economic investment,” contrary to what Paulson is trying to sell. Investment in such projects is only enabling millionaire owners to continue leeching off of the taxpayers. Here’s a thought, son of Hank: try paying for your own playthings. For as much as Dodgers owner Frank McCourt has been disagreeable in one way or another, I will say this about him – he may not have had enough assets at the time when he purchased the Dodgers. But here’s a novel concept – he borrowed the money using his own credit, not that of L.A., or its taxpayers. The state of Oregon and the city of Portland have far more pressing issues than bringing what amounts to another minor league team to the city. If son of Hank wants new stadia, perhaps he can borrow the money from dear old Dad. Bailout recipient Citibank purchased the naming rights to the Mets’ new yard for something along the lines of $400 milion, which I presume is the standard price for such a thing these days. 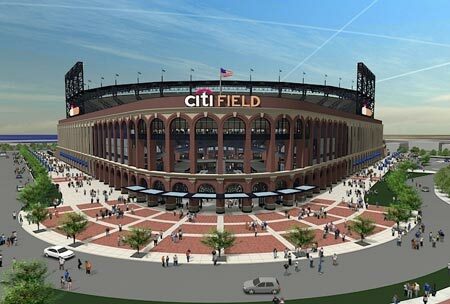 Then again, considering the citizens of New York are already putting in $260 million of their own money into the construction of this park, on top of bailing out Citibank to the tune of $25 billion or so, Field of Schemes suggests a more appropriate name would be CITY Field. Considering Citibank is now getting that much more of my money — first the taxpayer-funded bailout, and now they’re doubling my credit card interest rates as part of an overall rate increase — perhaps I can stake my claim to the new park. While my contribution to keep Citibank afloat may not be enough to slap my name on a sign in front of the stadium, there has to be something I can claim! I’ll make my case for free Dodgers/Mets tickets next time I’m on the phone with a Citibank CSR. Thank goodness Seattle’s taxpayers had the sense to send the Sonics packing when they came begging for public money. I only hope Portland will do the same, now that Merritt Paulson — yes, son of Hank Paulson — is begging its taxpayers to hand over $40 million to replace perfectly functional PGE Park.